John is the Center Director at the Patuxent Wildlife Research Center. His scientific training is in terrestrial animal ecology and physiology, and was hired initially at Patuxent to undertake research on wildlife toxicology. John has overseen the work of the Contaminants group, the Systematics group (stationed at the National Museum of Natural History, Smithsonian) and the Endangered Wildlife group. He led the whooping crane restoration program at Patuxent and sits on the US-Canada Whooping Crane Recovery Team. Project Specialist, (1982‑83) Bureau of Wildlife Management, Wisconsin Dept. Natural Resources, Madison, WI. Research Assistant (summers 1977‑79) Nome, AK, NOAA contract to the College of the Atlantic, Bar Harbor, ME; ecological research on effects of energy development on colonial seabirds and waterfowl in the northern Bering Sea, Alaska. French, John B.; Converse, Sarah J.; Austin, Jane E.
French, J.B., Jr., Converse, S.J., and Austin, J.E., 2018, Whooping Cranes Past and Present, in French, J.B., Jr., Converse, S.J., and Austin, J.E., editors, Whooping Cranes: Biology and Conservation: San Diego, CA, Academic Press, Biodiversity of the World: Conservation from Genes to Landscapes, p. 3-16. Fallacara, Dawn M.; Halbrook, Richard S.; French, John B. Toxic effects of dietary methylmercury on immune system development in nestling American kestrels (Falco sparverius); 2011; Article; Journal; Environmental Toxicology and Chemistry; Fallacara, Dawn M.; Halbrook, Richard S.; French, John B. 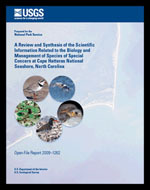 Toxic effects of dietary methylmercury on immune function and hematology in American kestrels (Falco sparverius); 2011; Article; Journal; Environmental Toxicology and Chemistry; Fallacara, Dawn M.; Halbrook, Richard S.; French, John B.
Nichols, J.W. ; Bennett, R.S. ; Rossmann, R.; French, John B.; Sappington, K.G. A physiologically based toxicokinetic model for methylmercury in female American kestrels; 2010; Article; Journal; Environmental Toxicology and Chemistry; Nichols, J. W.; Bennett, R. S.; Rossmann, R.; French, J. B.; Sappington, K. G.
Mercury in the blood and eggs of American kestrels fed methylmercury chloride; 2010; Article; Journal; Environmental Toxicology and Chemistry; French, J. B.; Bennett, R. S.; Rossmann, R.
Bennett, Richard S.; French, John B.; Rossmann, Ronald; Haebler, Romona J.
Dietary toxicity and tissue accumulation of methylmercury in American kestrels; 2009; Article; Journal; Archives of Environmental Contamination and Toxicology; Bennett, R.S. ; French, J.B., Jr.; Rossmann, R.; Haebler, R.
Sughrue, K.M. ; Brittingham, M.C. ; French, J.B.
Endocrine effects of the herbicide linuron on the American Goldfinch (Carduelis tristis); 2008; Article; Journal; Auk; Sughrue, K.M. ; Brittingham, M.C. ; French, J.B.
Albers, P.H. ; Koterba, M.T. ; Rossmann, R.; Link, W.A. ; French, J.B.; Bennett, R.S. ; Bauer, W.C. Effects of methylmercury on reproduction in American kestrels; 2007; Article; Journal; Environmental Toxicology and Chemistry; Albers, P.H. ; Koterba, M.T. ; Rossmann, R.; Link, W.A. ; French, J.B.; Bennett, R.S. ; Bauer, W. C.
2017 September Evening Public Lecture — What's in a species name? * What have museum collections taught us about invasive diseases? * When is an endangered species not a species? * How can birds in a museum help protect airline passengers?